Concept/Program: A freighter captured during the Russo-Japanese war and converted to a minimal seaplane carrier following service as a transport. This ship did not immediately lead to additional aviation ships, but did set the pattern for later seaplane carriers. Design/Conversion: Canvas shelters fitted over well decks; cargo booms used for hoisting aircraft. Modifications: Fitted with a flying-off platform for landplanes in 1920. Departure from Service/Disposal: Became a trials ship in 1924. Built by Duncan, Port Glasgow. Laid down 1900, launched 21 Sept 1901, completed ???. Captured 1905, used as transport. Converted to seaplane carrier 1914, completed 17 Aug 1914. Raided German installations in 1914. Reclassified as an aircraft carrier 4/1920 and fitted with a flying-off deck. Trials ship after 1924, stricken 1 April 1931 and subsequently scrapped. Concept/Program: Two oilers given minimal conversions to act as seaplane carriers during the inter-war years. They could operate as tankers while in the seaplane role, and later returned to tanker duties exclusively. Design/Conversion: Large platforms built up ahead and astern of the bridge and several cranes were fitted. Departure from Service/Disposal: Both returned to tanker duties. Built by Kawasaki, Kobe. Laid down 24 Nov 1919, launched 3 May 1920, completed 10 Aug 1920. Converted to seaplane carrier in 1924. Saw combat during the Sino-Japanese war. Reconverted to an oiler in 1942. Scrapped 1947. Built by Osaka. Laid down 1921, launched 29 Sept 1921, completed 14 March 1922. Converted to seaplane carrier 1924. Recoverted to oiler 1931. Torpedoed and sunk 8/1942. Concept/Program: A third oiler/seaplane carrier, apparently a replacement for Tsurumi. Design/Conversion: Same as Notoro class. Departure from Service/Disposal: Designated as a seaplane tender in 1940, but reconverted to a tanker in 1943. Photos: [Kamoi as converted], [Overhead view of Kamoi]. Built by New York Shipbuilding. Laid down 14 Sept 1931, launched 8 June 1922, completed ???. 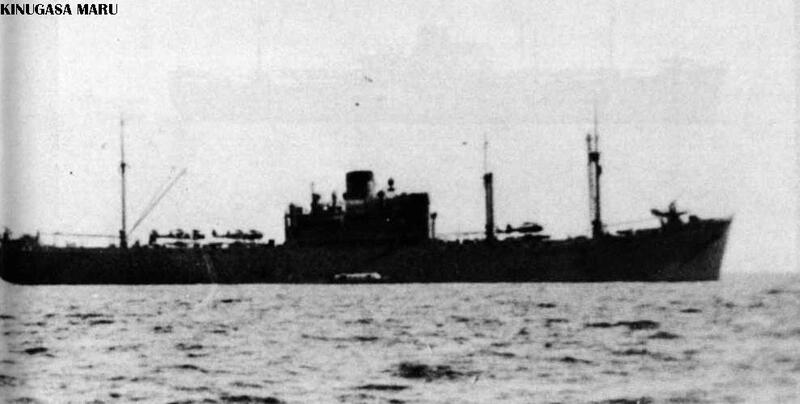 Converted to seaplane carrier at Tokyo 1932-33. Redesignated as a seaplane tender 1940, reconverted to a tanker 1943. Sunk at Hong Kong 5 April 1945, hulk scrapped postwar. Concept/Program: Various merchant ships - generally similar, but not identical - taken over and converted in 1937-1942. Design/Conversion: Fitted with two catapults in the aft well deck, cranes fitted to recover aircraft. Other modifications were minor. Operational: Saw extensive service along the Chinese coast. Departure from Service/Disposal: Most were converted to transports early in WWII. All eventually fell victim to US submarines or aircraft. Built by Harima SB, completed 1936; taken over for naval service as seaplane tender 1937. Returned to merchant service 1939, taken over as transport in 1941 and sunk by US submarines Bream and Ray 4 November 1944. Built by Kawasaki, Kobe, completed 1937; taken over for naval service as seaplane tender 1937. Became aircraft transport 1938, then seaplane carrier in 1939. Sunk 28 April 1943 by US submarine Scamp. Built by Kawasaki, Kobe, completed 1938; taken over for naval service as a seaplane carrier in 1941. Sunk 23 October 1944 by US submarine Sawfish. Built by Kawasaki, Kobe, completed 1937; taken over for naval service as a seaplane carrier in 1941. Became a transport in 1942. Damaged by US air strike and beached 25 July 1945. Presumably scrapped postwar. Built by Kawasaki, Kobe, completed 1937; taken over for naval service as a seaplane carrier 1942. Became a transport in 1943. Sunk 30 April 1945 by US aircraft. Built by Kawasaki, Kobe, completed 1936; taken over for naval service as a seaplane carrier in 1938. Returned to owners in 1939, then taken over as a transport in 1941. Sunk 7 October 1944 by US submarines Baya and Hawkbill. Built by Mitsubishi, Nagasaki, completed 1940; taken over for naval service as a seaplane carrier in 1941. Became a transport in 1942. Damaged by US submarine Harder 22 June 1943 and beached to prevent sinking; stricken and presumably scrapped postwar. Built by Mitsubishi, Nagasaki, completed 1939; taken over for naval service as a seaplane carrier in 1941. Became a transport in 1942. Sunk by U.S. submarine Spadefish 28 January 1945. Built by Mitsubishi, Nagoya, completed 1940; taken over for naval service as a seaplane carrier in 1941. Became a transport in 1943. Sunk 26 May 1944 by U.S. submarine Cabrila. Concept/Program: Japan's first new-construction seaplane carriers; Japan's ships of this type were the world's only purpose-built seaplane carriers, and by far the best seaplane carriers commissioned. They were meant for operations with the fleet in a scouting role. Built as fleet part of the "Shadow Program", they were meant to be easily convertible to fleet oilers, submarine tenders, or light carriers. Following the carrier losses early in WWII both underwent reconstruction as carriers, but had fairly short and unproductive careers. Design: Cruiser-style hull with guns and small superstructure forward, seaplane deck aft. 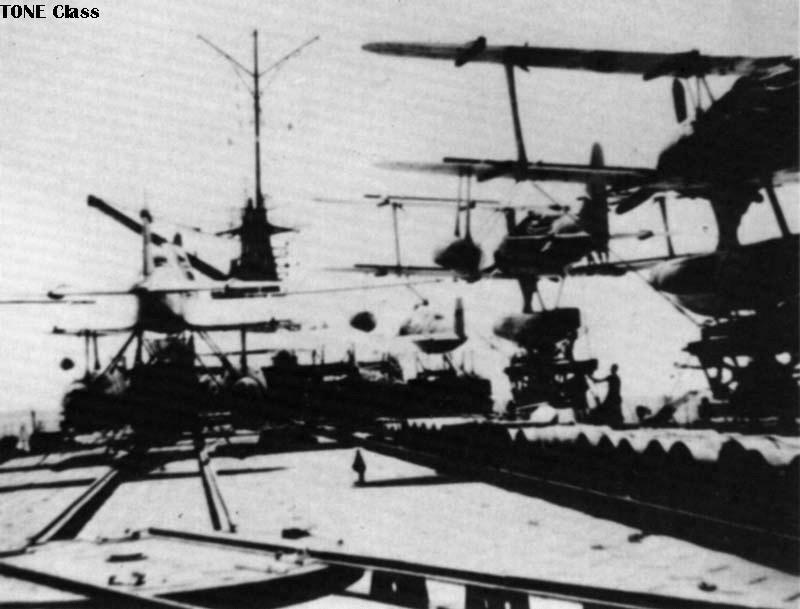 Seaplane facilities included 4 catapults, 5 cranes, an extensive track system for moving aircraft on deck, a large platform forming a roof over part of the seaplane deck, and a below-decks hangar. Modificiations: Modified in 1941 to carry and launch 12 midget submarines; the subs were stored in the aircraft hangar and launched through a stern door/gate. Seaplane capacity was reduced to 12 aircraft. Departure from Service/Disposal: Both converted to light fleet carriers in 1943-44 and subsequently lost during Leyte Gulf, while acting as decoys. Photos: [Chitose as completed - seaplane carrier], [Chitose as aircraft carrier], [Chiyoda or Chitose under attack]. Built by Kure Navy Yard. Laid down 26 Nov 1934, launched 29 Nov 1936, completed 25 July 1938. Sailed with the main strike force at Midway but saw no combat. Damaged at Eastern Solomons, 1942. Reconstructed as a light carrier at Sasebo Navy Yard 1943 to 1 Jan 1944. 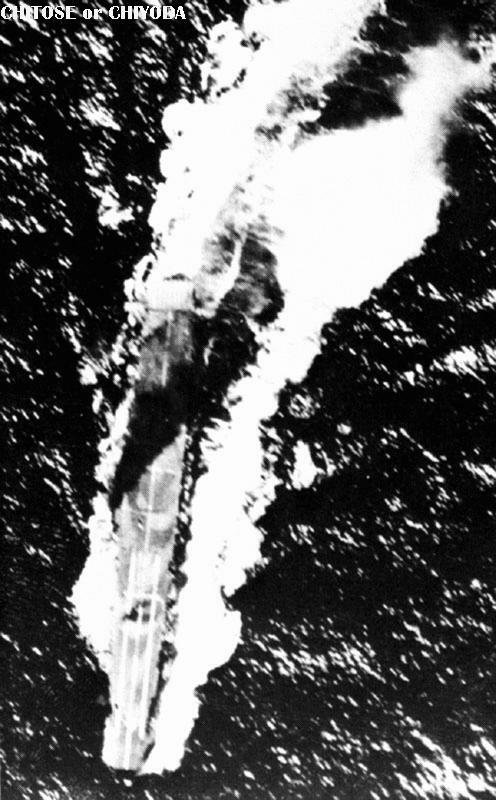 Bombed and sunk during Leyte Gulf, 25 October 1944, while serving as a decoy. Photos: [Chiyoda as completed - seaplane carrier], [Chiyoda or Chitose under attack]. Built by Kure Navy Yard. Laid down 14 Dec 1936, launched 19 Nov 1937, completed 15 Dec 1938. Sailed with the main strike force at Midway but saw no combat. Rebuilt as light carrier at Yokosuka Navy Yard 1942 to 31 Oct 1943. Disabled by aircraft, sunk by cruiser and destroyer gunfire during Leyte Gulf, 25 October 1944, while serving as a decoy. Concept/Program: A follow-on to the Chitose class. She would have been converted to a carrier if she had survived long enough. Design: Essentially the same as Chitose class except there was no platform over the seaplane deck, and she had diesel engines. Modifications: Fitted to operate 12 midget subs in 1941; 2 additional triple 25 mm AA added. Operational: Operated in support of invasions for most of her career. Departure from Service/Disposal: Sunk in 1942. Built by Kawasaki, Kobe. Laid down 1 May 1937, launched 16 May 1938, completed 25 Feb 1939. Sunk by submarine Drum 2 May 1942. Concept/Program: A follow-on to Mizuho. She would have been converted to a carrier if she had survived long enough. Design: Essentially the same as Mizuho but with more powerful engines, re-arranged guns, and fitted to carry 700 mines as an alternative to seaplanes. Modifications: Fitted to operate 12 midget subs in 1942. Departure from Service/Disposal: Sunk in 1943. Built by Kure Navy Yard. Laid down 11/1938, launched 30 Nov 1939, completed 27 Feb 1942. Sailed with the main strike force at Midway but saw no combat. Operated as a troop transport during Bougainville operations; sunk by US aircraft in this role 22 July 1943. Concept/Program: Two larger versions of Nisshin were planned in 1942 but were not built. Concept/Program: The only seaplane tender completed by Japan. Her intent was similar to US ships - to provide mobile base facilities in forward areas. Three sisters ships were cancelled, as were plans to build six smaller and one larger seaplane tenders. Design: Small hull similar to IJN training cruisers, small superstructure forward, huge crane at stern, seaplane working deck aft. No hangar. Departure from Service/Disposal: Sunk in 1944. Built by Kawasaki, Kobe. Laid down 1940, launched ?? ?, completed 3/1942. Sunk by US aircraft 24 September 1944. Construction cancelled; never laid down. Two additional ships were planned but were cancelled; never laid down. Concept/Program: Large, fast fleet scouting cruisers equipped with extensive seaplane facilities. Design: Initially designed as light cruisers (4 triple 6.1/50 DP), but completed with 8" guns due to expiration of treaties. 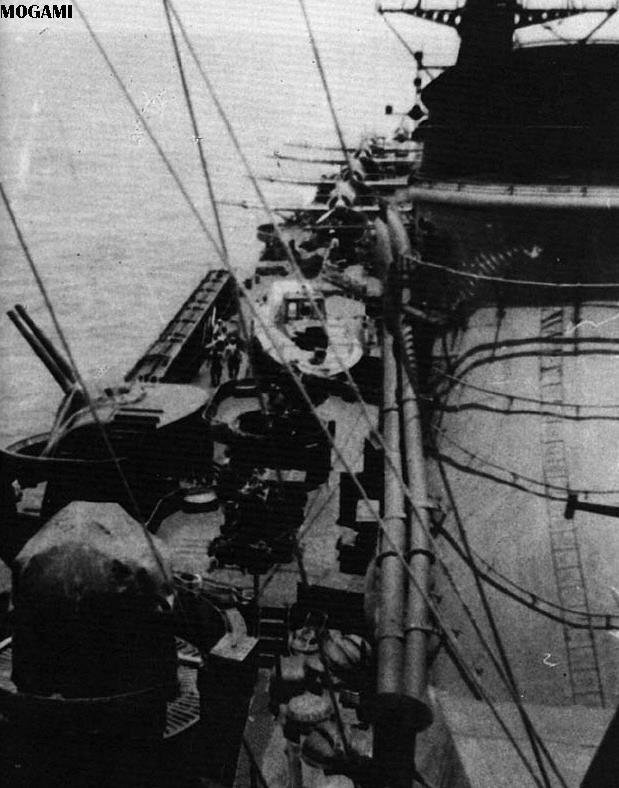 All guns were forward, with seaplane facilities occupying the aft half of the ship. 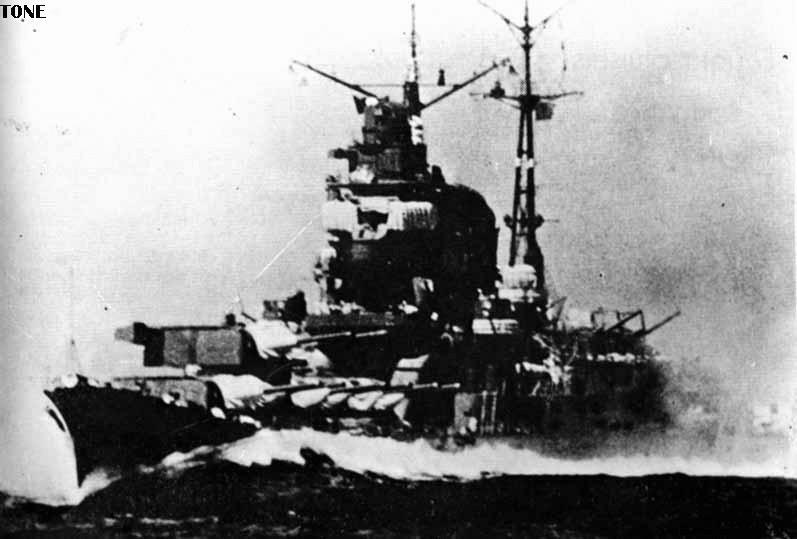 In other aspects they followed typical Japanese "Type A" cruiser design practices. Operational: Often operated as primary escorts and scouts for carrier striking forces. Departure from Service/Disposal: Both sunk by US aircraft late in the war. Photos: [Tone as completed], [Firing a broadside], [Closeup of Tone fueling at sea], [Tone sunk], [Salvaged postwar], [Looking aft aboard a Tone class ship], [Looking forward aboard a Tone class ship]. Built by Mitsubishi, Nagasaki. Laid down 1 Dec 1934, launched 21 Nov 1937, completed 20 Nov 1938. Bombed and sunk at Kure by US aircraft 24 July 1945. Hulk salvaged and scrapped in 1948. Photos: [Chikuma], [Looking aft aboard a Tone class ship], [Looking forward aboard a Tone class ship]. Built by Mitsubishi, Nagasaki. Laid down 1 Oct 1935, launched 19 March 1938, completed 20 May 1939. Sunk by US aircraft torpedoes at Samar 25 Oct 1944. Concept/Program: Taking the Tone concept one step farther, this ship was rebuilt with a seaplane flight deck over the aft one-third of the ship following damage at Midway. This was intended as an emergency measure to alleviate the carrier crisis. Design/Conversion: Originally built as a light cruiser (5 triple 6.1/50), then reconstructed to correct structural defects, then rebuilt as a heavy cruiser (5 dual 8/50). After major damage at Midway she was rebuilt with a seaplane deck over the aft 1/3 of the ship. Operational: Probably saw little service as a seaplane ship. 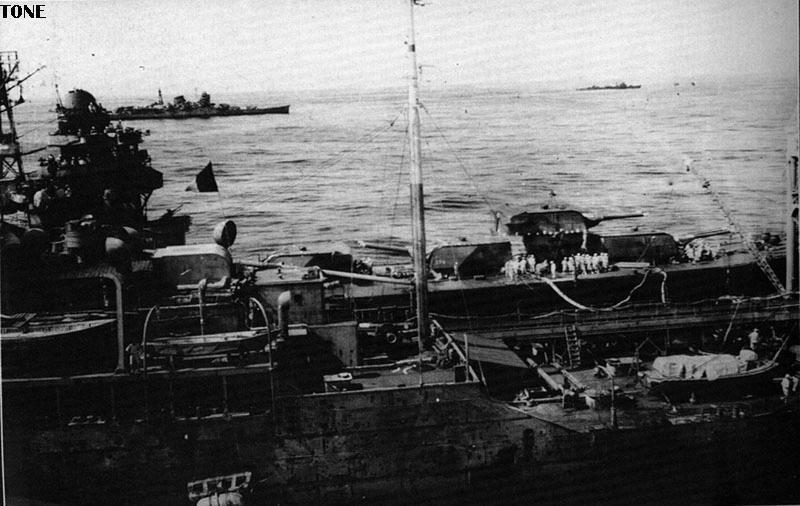 Departure from Service/Disposal: Sunk at Leyte. Photos: [Mogami as completed], [Mogami as converted], [Looking aft aboard Mogami as converted]. Built by Kure Navy Yard. Laid down 27 Oct 1931, launched 14 March 1934, completed 28 July 1935. Reconstructed 1938-1939. Regunned and rebuilt as heavy cruiser at Kure Navy Yard 1939-1940. Damaged by US aircraft and collision with Mikuma at Midway. Rebuilt as a seaplane cruiser at Kure Navy Yard 1942-1943. Damaged by cruiser and destroyer gunfire, US aircraft and collision with friendly ship in Surigao Strait 25 Oct 1944 and scuttled. Concept/Program: Originally planned as a flagship for scouting squadrons operating in support of submarine operations, with extensive command/flagship facilities. 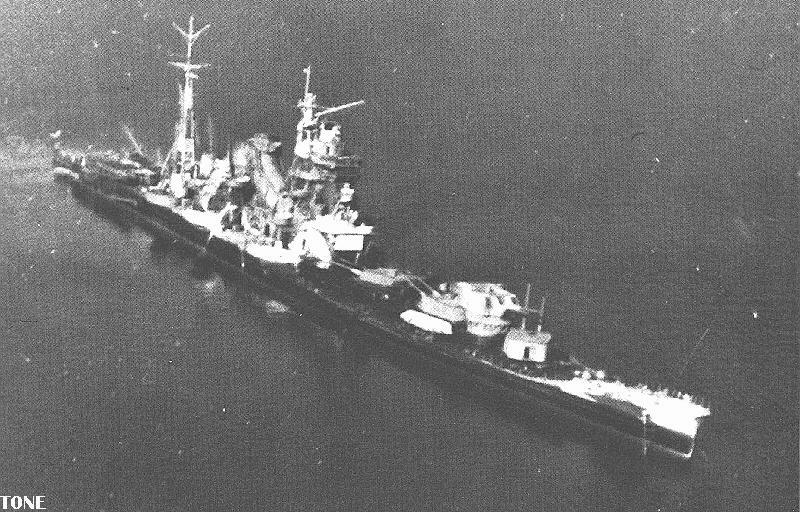 The one completed ship served as a conventional cruiser, and the remainder of the class was cancelled. Design: Typical light cruiser design, but with extremely large catapult and hangar at the stern. She was completed with a conventional catapult in place of the larger device, and operated only two planes due to the aircraft shortage. Modifications: Carried up to 52 25 mm AA during WWII. Departure from Service/Disposal: Sunk in the late-war fleet destruction raids. Built by Kure Navy Yard. Laid down 14 Feb 1941, launched 2 April 1942, completed 28 Feb 1943. Bombed and sunk at Kure by US aircraft 28 July 1945. Hulk raised and scrapped in 1948. Planned in 1942 but never laid down. Seven ships planned in 1942 but never laid down. Concept/Program: Due to the extreme carrier losses at Midway, two battleships were rebuilt with seaplane decks in place of their aft 14" gun turrets. They were useless in this role due to a lack of aircraft. Design/Conversion: Aft two turrets removed, flight deck, hangar and cranes were fitted. There were corresponding modifications to secondary armament, and increased light AA armament. 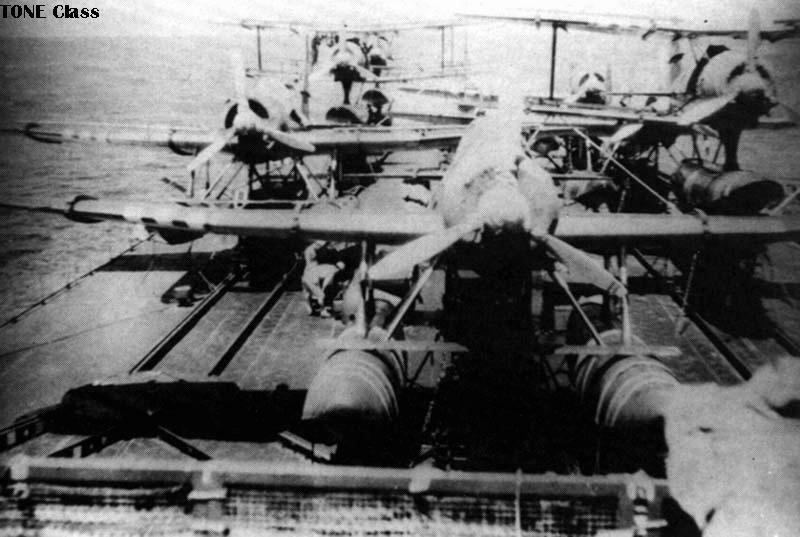 The planes were to be catapulted from the deck, then recovered from the sea. Modifications: AA increased to 104 25 mm and 6 4.7 inch rocket launchers in 1944. Catapults removed 10/1944. Operational: Apparently never embarked any aircraft. 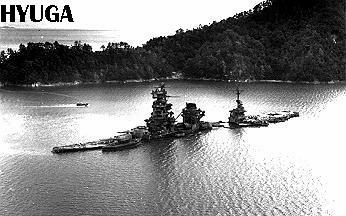 By 1944 they had been reduced to service as decoy ships at Leyte Gulf. They were inactive late in the war. Departure from Service/Disposal: Sunk in the late-war raids; hulks scrapped postwar. Photos: [Ise as completed], [Following 1930's reconstruction], [As battleship-carrier]. Built by Kawasaki. Laid down 10 May 1915, launched 12 Nov 1916, completed 15 Dec 1917. Reconstructed 1935-3/1937. Conversion to battleship-carrier completed 5 Sept 1943. Bombed and seriously damaged 24 July 1945, bombed and sunk near Kure 28 July 1945. Salvaged and scrapped postwar. Built by Mitsubishi. Laid down 6 May 1915, launched 27 Jan 1917, completed 30 April 1918. Reconstructed 1934-9/1936. Conversion to battleship-carrier completed 30 Nov 1943.